If you appreciate the rich look and durability of walnut furniture, look no further! Woodland Creek’s offers a fine selection of rustic furniture for each bedroom in your home, cabin, cottage or lodge – with wood furniture that suits any taste in country decorating. Start with our Black Walnut Slab Rustic Beds. Then saunter over and browse our Rustic Walnut & Barnwood Night Stands. Sleep tight! We dress walnut up in barnwood-furniture, hickory-furniture and cedar-furniture accents! Why settle for one wood type when you can have the best of both worlds? 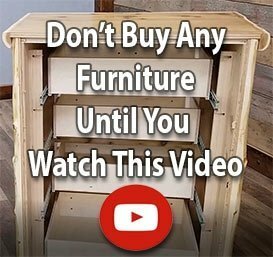 Customers appreciate our willingness to take risks and deliver handcrafted country furniture and cottage style furniture that’s one-of-a-kind and entirely unique. Consider our blended wood options for the bedroom, like the Black Walnut & Cedar Log Bed frame or our Real Walnut & Hickory Rustic Bed frame.